The definition of “purpose” is as follows: The reason for which something is done or created or for which something exists. 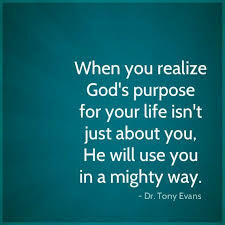 Have you ever thought about what your purpose is in life? This is something many people never really think about until they get older. When I was younger, I didn’t care what my purpose was. I just wanted to grow up, have fun, respect my parents, love my neighbor, find a hobby and play some sports. Somewhere along the line, I decided to go to college, get an education and a job, because I realized that I needed to earn a few bucks to pay the bills. Apparently, I wasn’t going to live at home forever. I also found a girl, got married, had 2 kids and bought a house. I went to church and found the Lord, but it was just something of a routine. It seemed to me that I was just living here on earth, but really wasn’t serving any purpose. But it wasn’t until recent years when I started thinking that there actually might be a real purpose for me being here. I still have no idea what that might be or where life may lead me, but there has got to be something else. There has to be another reason for my existence. It sure feels like God has something in store for me in the near future. I will let you know what that is once I find it. This entry was posted in Uncategorized on September 30, 2016 by BronsonQuon.